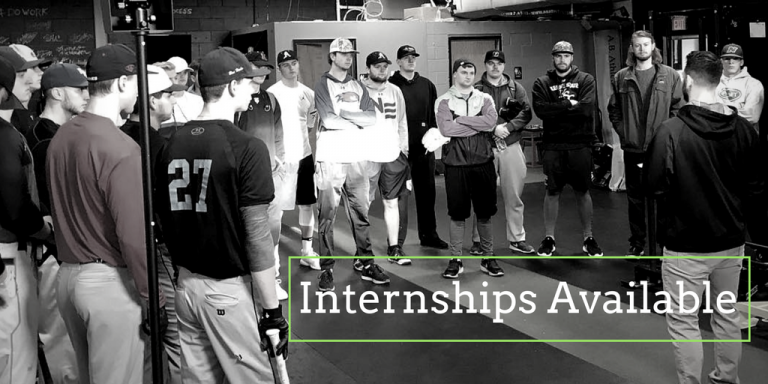 Wasserman Strength offers Internship Programs for the Summer, Fall, Winter and Spring Training Seasons. Winter intern dates are January 2nd – March 31st. An internship at Wasserman Strength will give you the opportunity to work with predominantly baseball and softball athletes of all ages and a staff consisting of Owner/Founder Austin Wasserman and his staff members. You will get hands-on experience with assessments and exercise techniques using High Speed Video and VBT Systems. You will learn how to develop and help manage athlete programming modules, athlete management systems, on floor training components, take part in our Weekly In-Services and much, much MORE! All interns will be provided with Wasserman Strength Apparel + Gear! Our internships are non-paid positions with variations in hours depending on the schedule. Summer interns are expected to be available in the mornings. Fall and Winter/Spring intern hours will vary. Upon completion of the internship, you will be provided with in-depth and detailed feedback and an opportunity to apply for a part-time or full-time position! If you are interested, please submit the Internship Form and send a copy of your resume to support@wassermanstrength.com. If you have a blog, website, or other published work, please send it in the body of the email for review. A cover letter with a brief outline of your experience and qualifications is expected.